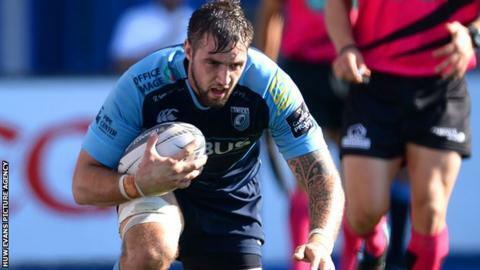 Josh Turnbull has signed a two-year contract extension with Cardiff Blues until the end of the 2017-18 season. The Wales international back-rower, 27, began the new season by scoring a hat-trick of tries in Sunday's Pro12 victory over Zebre. Turnbull, who has won seven international caps, said the arrival of new coach Danny Wilson over the summer was a "big factor in me staying". "We're looking to build something special," he said. Wilson worked with Turnbull during their time at the Scarlets and feels the forward will play a significant role this season. "He is a real leader, someone who puts his body on the line and is a fantastic professional," said Wilson. "He displays all the values that we are looking for in players who represent Cardiff Blues. "Josh has repeatedly proven his quality at both regional and international level. He remains a very ambitious player and the fact he has signed a new contract is testament to what we are striving to achieve here." The Blues recently gave captain and fellow back-rower Josh Navidi a new three-year contract.